A Literary Odyssey: Gulliver's Travels Read-Along Part One: A Voyage to Lilliput. Gulliver's Travels Read-Along Part One: A Voyage to Lilliput. I am very excited the first of my two June read-alongs is well under way. Gulliver's Travels is a huge treat and it has been a long time since I have read it and I am glad to be sharing the experience with a group of my readers! I first read about Gulliver in a class I took in college. The class focused on literature after Shakespeare and through the 18th century. My professor was in love with Swift, so we read a bunch of his work. Gulliver's Travels was by far my favorite. I should also point out that I am reading the very same copy I read for that class, the 1998 Oxford World's Classics Edition (which was reissued a few years ago with a new picture, so I cannot find an image of my own book). I was sad to see, however, that I read this book during my highlighting stage, so there is blue highlighter throughout the book. Sad, but I thankfully grew out of that! For those of you who have never read it and are not participating, it is important that I point out that much of the book is satirical. Swift is pointing out numerous flaws within society and government through his exploration of 4 different lands that Gulliver visits. In this first section, Gulliver explains his past and how he wound up on a boat in the first place. As a doctor in a smaller town, Gulliver realizes he must leave in order to support his family. Since he also loves to travel, he signs up to work on ships to learn more about the world around him. He shipwrecks and wakes on a beach to find himself tied down with scores of "little men and women" around him. This scene is probably one of the most famous from the book as a whole, and it is always fun to read about the men, who are only 6 inches tall, tying him down and attempting to shoot him with their small arrows. After attempts to assure the people that he is safe, he is led back to their city and becomes a favorite in court. The king grows to really like Gulliver and he seems to find some kind of happiness in observing the kingdom and court. There are a lot of noted differences between his height and the people around him. There is where a lot of the satire comes in, as well as some historical knowledge. Gulliver's observations of court is a definite jab at King George I. He sees the Lilliputians as silly and vicious, much as how Swift saw the court in England at the time. Gulliver's reflections on the court show that he believes the king and his subjects to be far inferior. Eventually, however, Gulliver's happy moments in Lilliput come to an end, as a plot to accuse him of treason unfolds. A friend helps his escape to the neighboring land of Blefuscu (the enemies of Lilliput), where he finds a washed up boat and returns to humanity. This section is definitely a little lighthearted and through Swift's satirical lens, the reader can see the faults in the kingdom of Lilliput and transfer those thoughts to the government of England. "The Heat I had contracted by coming very near the Flames, and by my laboring to quench them, made the Wine begin to operate by Urine; which I voided in such a Quantity, and applied so well to the proper Places, that in three Minutes the Fire was wholly extinguished," (43). This is what inevitably leads to the fall of Gulliver's favor in Lilliput and his eventual dismissal and escape. I love the way Swift makes this come alive. We are in Lilliput with Gulliver, and we too as exploring their society and way of life. When Gulliver learns about how they educate their children, we too are exploring the odd way that children are removed from their homes to be brought up as functioning members of this society. We are also there to read the little jabs at the society that Swift lived in. Before the incident with Gulliver putting out the fire, we learn that the fire emerged when a maid forgot to tend the fire since she was reading a Romance (43). Romantic types of novels and writings were emerging in this era, much to the disdain and horror of prominent writers. Perhaps Swift is cautioning young women to stay away? There is also the scene where Gulliver is forced to turn in his weapons, something that was done to some Jacobite supporters in Ireland in the 1710s, shortly before Swift's work was published. The intended "comical scene" sheds some light about the feeling of weapons being taken away from the men who own them. In addition to taking his weapons, the people of Lilliput also search his pockets, and their delights at finding mysterious objects in his pockets is pretty funny. The reader has to think to himself, "I know what that is," but as time passes on, we see objects from the past and wonder, what is that? It is like showing an Ipod to a child today and having them well aware of what it is and what it does. Take it back to the 1950s and people would have no idea what its purpose is. In all, this section on Lilliput is one of my favorites in the book. 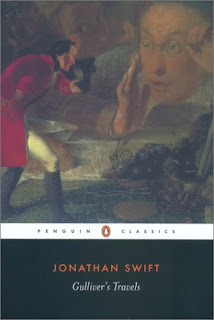 It gives us a great glimpse of who Gulliver is as well as Swift's satirical sense of style. I hope all of you enjoyed it as well and I am looking forward to reading your thoughts as well! It's been a little while since I've read this, but I remember lots of laugh-out-loud moments in this first part. Thanks for reminding me of some of them. I really connect with Swift's sense of humor. Thank you for your interesting review. I have never read this one so it is all new to me - but there was a literary magazine in the 1940s called Lilliput - I wonder if it was named after the kingdom?! Here's a link to my post about part 1: http://lindseysparks.blogspot.com/2010/06/gullivers-travels-part-1.html. Thanks for inspiring me to reread it! I love the satire, and the point about the romance novel is something I'd forgotten about. It is pretty funny. Hi Lindsey, your post popped up in the interim between my first visit here and my loading of my post. I'm going to go check it out now. I was worried that since I don't have much historical knowledge of British politics of the time that I wouldn't 'get' the satire, but it feels pretty universal. I thought some of the more 'utopian' sounding bits were interesting...I especially thought the whole 'Poor people wouldn't DREAM of burdening society with children just because they were horny' thing was hilarious, especially in light of 'A Modest Proposal'. I was a little nervous when he got to the subject of girls' schooling, but he seemed pretty progressive. I also liked the attention to detail...all of those little discussions about how big the geese were, how much food they ate, etc. just really helped bring it to life for me. Beforehand, I imagined the satire might trump the story, so I'm glad to find that's not the case! And those were my disjointed reactions to part one. Can't wait to start on Part Two! I'm entirely with Eva here - this book requires no knowledge of early 18th century British politics. Our rulers are big from one perspective, but awfully small from another. A universal and timeless idea. I enjoyed reading your comments here Eva! The difference between 18th-century writers and the Victorians surprised me too. The 18th century writers tend to sound more modern in many ways and can be easier to read, although I still love the Victorians too. I think reading the 18th century writers like Swift makes me feel more connected with my ancestors - we're really not that different from them when it comes down to it. Oh, I completely agree. I have noticed that I have a hard time comprehending some Victorian writers because everything seems so complicated. I am in the middle of Robinson Crusoe and the style is completely different than that of some Victorians. I find it much easier to read and understand, and I also feel like I can relate to. I may even venture to say that I find it far more modern than some of the 19th century writers I've come across!